The council approved a $729,879 transfer from the affordable housing trust fund to the AAHC to support the “West Arbor” portion of the AAHC’s renovation plan. And the council also took two actions in specific support of the West Arbor portion of the plan. The council gave initial support to a zoning revision for a project at 3451 Platt Road, which will entail demolishing four 5-bedroom units – because of their current placement in the floodplain – and constructing 32 townhomes and a community center. A third council action on Sept. 2 was approval of a site plan for North Maple Estates, which currently offers 19 units. All those units will be demolished and replaced with 42 townhomes. The $729,879 transfer from the affordable housing trust fund would leave a $850,920 balance in the trust fund. The trust fund’s current balance stems largely from the council’s decision late last year – on Dec. 16, 2013 – to deposit the net proceeds of the sale of the former Y lot into the trust fund. By way of background, in 2012 the city was accepted into a new rental assistance demonstration program, known as RAD, offered by the U.S. Dept. of Housing and Urban Development (HUD). The program allows residents in selected housing units to receive rental assistance through long-term Section 8 subsidy vouchers that are tied to the buildings, rather than individuals. The RAD program also enables entities like the AAHC to partner with private-sector developers on housing projects – something the AAHC couldn’t previously do. The Ann Arbor city council gave necessary approvals in connection with the RAD program at its June 3, 2013 meeting. Financing for the RAD program is primarily through low-income housing tax credits (LIHTC). According to the memo accompanying this item, out of the $16,564,370 project budget for West Arbor, low-income housing tax credits and permanent debt are expected to cover $14,091,491. That leaves a gap of $1,472,879. The AAHC has secured $50,000 from the Michigan State Housing Development Authority (MSHDA) and $293,000 from a Community Challenge Planning Grant. 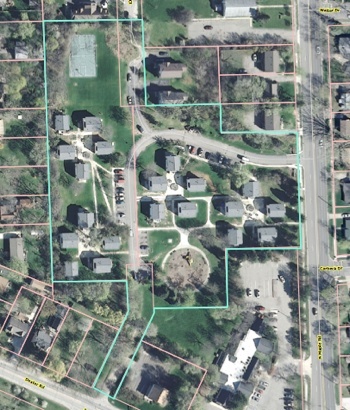 So the AAHC has requested up to $729,879 in capital funding support from the Ann Arbor housing trust fund for the West Arbor portion of the RAD conversion. The initial approval given by the council for the Lower Platt project is from R1C (single-family dwelling district) and R2A (two-family dwelling district) to R4B (multi-family dwelling district). Final approval of the zoning, as well as the site plan approval, will come before the council at a subsequent meeting, probably in October. The planning commission had sent the rezoning request for the 3451 Platt Road property to the city council with a recommendation of approval – in a vote taken at its Aug. 6, 2014 meeting. However, commissioners postponed consideration of the site plan for the five-building, 32-unit project, amid concerns about the site’s location in the floodplain and stormwater management. The postponement was supposed to allow time to address staff concerns regarding the impact on natural features. Zoning and site plan approval must ultimately be given by the city council. However, the zoning approval will require two votes by the council at two separate meetings – because changes to the zoning code are actually changes to a city ordinance. So the site plan’s delay would not necessarily delay the project, as long as the site plan is put in front of the council for consideration by the time the council takes a second vote on the rezoning. The site includes a property currently owned by AAHC, as well as an adjacent parcel that’s being purchased by the city on behalf of AAHC. The AAHC Platt Road project is different from a Washtenaw County-owned property at 2260 and 2270 Platt Road, the former location of the county’s juvenile center. That site is also being considered for affordable housing. Other AAHC-related action by the council on Sept. 2 included site plan approval for North Maple Estates. It calls for demolishing 20 existing single-family homes at the public housing complex on North Maple and constructing an eight-building, 42-unit apartment complex with a total of 138 bedrooms. The rezoning of the 4.8-acre site at 701 N. Maple Road already has been given final approval by the city council at its Aug. 18, 2014 meeting. The zoning was changed from R1C (single-family dwelling district) to R4B (multi-family dwelling district). The Ann Arbor planning commission had recommended the zoning and site plan for approval at its meeting on June 17, 2014. The council gave initial approval of the rezoning at its July 7, 2014 meeting.